I love smoking a cigar with my friends and I certainly love to smoke a cigar with my wife and family, but there is a special place in my heart for smoking a cigar with man's best friend. They don't care that I am smoking a cigar as long as they are outside running around and playing and within my sight. I adore them. They protect the house and family when I am not there and act as if I am returning from war when I come home from work. With a cigar in hand we take command of our urban quarter of an acre. They calmly sit at my feet but bark at the passersbys with the fury of dragons. 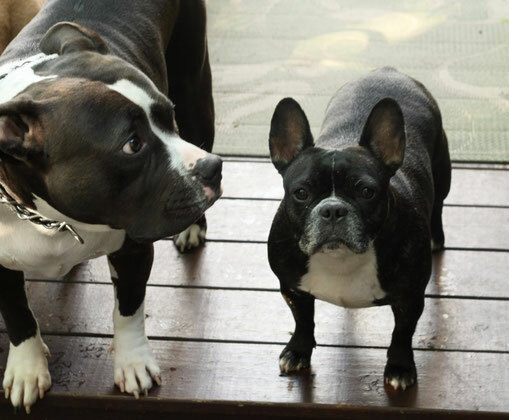 People see a blond pit bull (Buddy), a short but stout black and white French Bulldog (Motor), and a Black and White American Bully (Turbo) and react as if they are going to be eaten alive. But its all a facade. They are just showing daddy that they are on the job and that I can smoke my cigar in peace. This is our special time together and while their stay on this Earth is shorter than mine I will remember these special moments with them forever.